National Milk Records (NMR) celebrates 60 years of milk recording this year and the company plans to mark the occasion with an anniversary gathering of dairy farmer customers and friends on its stand at this year’s Dairy Event at Stoneleigh on 17 September. 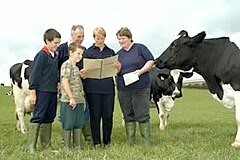 Among the longest to have milk recorded are the Crozier family from Lower Stotfold, Elwick, Durham, who have been NMR customers since it started and still have their records from 1943. The Milk Marketing Board took over National Milk Records (NMR) in England and Wales from the Ministry in 1943. They, in turn, had taken control of national milk recording from the federation of country and branch clubs. By the mid 1950s NMR was recording 50 per cent of dairy herds in England and Wales and 60 per cent of cows. The service was supported financially by the MMB and Ministry. Following withdrawal of Ministry support, the MMB continued its support by a subvention of around 30 per cent of NMR’s costs, as it was deemed that all producers derived some benefit from the information provided by the service. Since 1997 NMR has been a totally independent company whose success depends upon providing the modern, cost-effective services required by its customers. Despite these changes, it is still by far the major milk recording organisation in Britain and through its on-farm services and dairy management programs it still records and manages data for over half the country’s herds. Alan and Marguerite Croziers' sons, Robert and Stephen, Alan, NMR's field manager Lynn Stoker and Marguerite - looking at some of the old records that go back to 1942. Their cow, Brunton Season, was the highest yielding animal in the county giving 14,473lbs (6,571kg) in 355 days. Although the Friesians gave most milk, the predominant breed in Durham was still Shorthorn. And of all the herds in the county only three were producing over 10,000lbs (4,540kg). Particularly interesting are the comments in the 1943 NMR report from Cecil Pawson, then senior lecturer at King’s College, Newcastle upon Tyne. He urged those dairy farmers not milk recording to re-consider, describing it as the first step in dairy farming. Milk records, he said, are an essential means of increasing output and reducing costs of production in a way that will not impair efficiency. But he did stress that milk records need proper interpretation so they can be used as an efficient management tool. The same arguments hold true today. The Biggen herd is now managed by grandson Alan in partnership with his father Dennis and brothers Colin and John. The herd has developed into 190 pedigree Holstein Friesians with an average yield of 7,863kg and 615kg of fat plus protein. They remain firm advocates of accurate milk records and have recently introduced impelPRO software, which manages and analyses their herd records for management purposes and automatically transfers required information to third parties. There’s no doubt that NMR records have contributed to the success of the herd. Still regular winners in herd competitions, their latest success is Best Cow in County award this year with Biggen Mab 139. She scored top points for a combination of production, inspection and calving interval over the past three years. In her fourth and most recent lactation she gave 10,644kg of milk and 843kg of fat plus protein. And, in line with her herd mates, Mab an average cell count of 59,000 per ml. Andy Warne, managing director for NMR is seeing increasing demand for milk recording. “Although the total number of dairy farms is declining, cow numbers are relatively stable,” he says. “ There is increasing demand for good on-farm records and information from our customers, consultants, retailers, the government and consumer organisations generally.